A major North Sea oil & gas operator has upgraded the Flare Gas Metering Systems on three of its platforms from previous versions of the Fluenta range of ultrasonic meters to the current generation. As the exclusive UK channel partner for Fluenta AS, process control specialists ABLE Instruments & Controls Ltd, supplied three Model FGM160 II’s to replace the existing Model FGM100 and FGM-130’s. The acclaimed FGM160-II has been developed to specifically measure flare gas in pipes where pressure, velocity and large pipe diameters represent a real challenge. The non-intrusive design of the FGM160-II does not penetrate the flow stream, providing a longer transmit path for improved turn down. Furthermore, the FGM-160 does not obstruct the gas flow and therefore transducers are not exposed to potential damage from high velocity particles. This reduces maintenance costs and increases life expectancy. The Fluenta flare gas meter is the most robust and accurate flare monitor on the market today and an essential tool for E&P operators. With over 1300 flare metering systems in operation worldwide, Fluenta is a world leader in ultrasonic flare gas metering. Whilst making maximum use of the existing infrastructure such as transducer and temperature/pressure transmitter mountings, it was ABLE’s recommendation that the new installation incorporate double block & bleed (DB & B) valves for increased safety. The D B & B valves achieve both primary and process isolation with the means to safely dispose of unwanted gas and liquid trapped within the assembly. 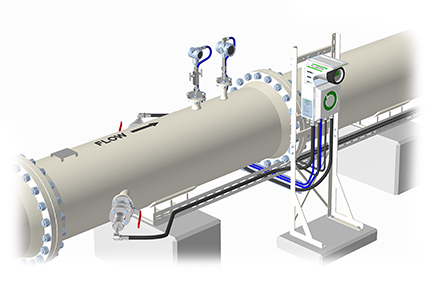 ABLE’s scope of supply also included Fluenta’s SOFTFLOW Basic system, which is designed to control and monitor Fluenta Flare Gas Metering systems. This user-friendly solution improves the way critical information is acquired and combined by using advanced graphs and customizable alarm features. SOFTFLOW’s web browser based interface facilitates constant remote control and diagnosis of multiple FGM systems and stores historical records of measured and calculated data.